The beautiful region in southern Saxony along the border with the Czech Republic is known as (hold tight — it’s a horribly long name:) Sächsische Schweiz-Osterzgebige — Saxon Switzerland-East Ore Mountains. The amazing red-sandstone peaks that helped to name this area are mainly over to the east of the district, but the majority of the region is mountainous. A place of extremes, the town of Altenberg has bobsleigh and luge runs where that of Bad Gottleuba-Berggießhübel has outdoor baths and spas! Claiming the oldest steam railway in Germany (the Weisseritz) and the second oldest town in Saxony (Dohna), it also holds claim to be the birthplace of German watchmaking — with many museums and shops to explain all. It also has one of only a handful of Truss Towers in Europe, carrying tourists vertically up the cliffs in Bad Schandau to admire the great views. 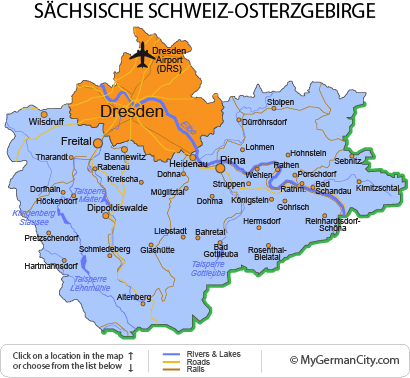 The Sächsische Schweiz-Osterzgebige is really famous for its scenery though, which attracted many Swiss artists and walkers into the mountains — and it is these few who earned the region its title!